The PC co-op goodness of Jamestown on your PS4 with new stuff! Jamestown Plus, the PS4 version of co-op shmup Jamestown, is dropping on PS4 today, months earlier than originally anticipated. Not to be confused with a simple console port, Jamestown Plus is introducing new content to the game so both veterans and newcomers can all find something new to enjoy. 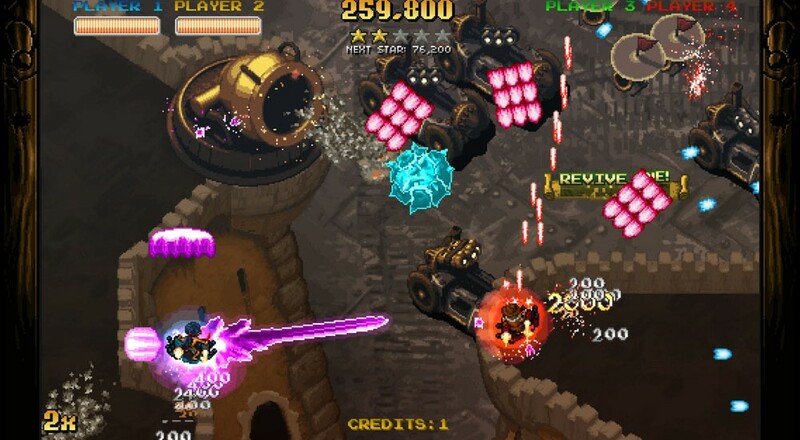 The PS4 version of the game will be adding "The Armada Matrix," (three new characters, each with two unique special weapons and six new shot types), two new levels (the Black Garrison of Phobos and the Shifting Sands of Deimos) complete with new enemies and bosses, remastered 5.1 surround sound soundtrack and sound effects, and a platinum trophy. The Gunpowder, Treason, and Plot DLC will also be available on PS4 from Jamestown Plus' launch, purchasable for $2. Jamestown Plus is part of Playstation's Spring Fever 2015, meaning that PS Plus members can pick it up for 10% off the week it launches (March 17th through March 23rd). So that's $10.79 for PS Plus members launch week, with $11.99 being the standard price. We found Jamestown on the PC to be a fantastic game, giving it a 4.5 out of 5. We hope that Jamestown Plus on the PS4 will be similarly breathtaking. Jamestown Plus supports up to 4 players in local co-op on the PS4. It's out today, March 17th, 2015.